The holiday season is a perfect time for giving back and you can feel good and spread the holiday cheer to those in need by purchasing charitable and socially conscious gifts. One : BKR Water Bottle : $28 : These pretty glass water bottles come in a stunning array of colors and a portion of each purchase support initiatives that fund early cancer detection and combat the global water crisis. Two : Perfect 10 Kookie Tin : $22 : Model Karlie Kloss collaborated with Momofuku Milk Bar in NYC to create these healthy dairy and gluten free cookies which are sweetened with agave. A portion of the profits from each tin will go towards providing 60 school meals to hungry children around the world through a partnership with FEED. Three : One Hope Wine : $18.99 : One Hope supports a number of notable causes and offers a wide selection of wines. Half the proceeds from each bottle benefits a specific cause like the fight against Breast Cancer, supporting our troops or ending childhood hunger among others. Four : MAC Viva Glam Lipstick : $15 : Every cent from the sales this lipstick goes to the MAC AIDS Fund dedicated to support the fight against HIV/AIDS. Five : TOMS Shoes : $54 : This popular brand stands by it's longstanding policy of donating a pair of shoes or boots to someone in need for every pair sold. They also recently launched a Marketplace that features carefully selected socially conscious products from other like minded companies. Six: Krochet Kids Hats : $19.95 - $35.95 : Krochet Kids International empowers women in Uganda and Peru by providing them with jobs, education and mentorships through handmade hats and accessories. Seven : Warby Parker Sunglasses : $95 - $145 : Through a partnership with VisionSpring , Warby Parker distributes a pair of glasses to someone in need for every pair of glasses or sunglasses sold. Eight : Wink Bags : $36 : Wink toiletry bags are filled with Soap & Paper Factory products and for each bag purchased, one is donated to the Ronald McDonald House Family Rooms which provides a resting place for the families of critically ill children in hospitals. Nine: Roma Rain Boots : $84 : For every pair of Roma Boots sold, a pair is donated to a child in need and 10% of all sales proceeds go to the Roma For All Foundation which fights childhood poverty and provides education. Ten : Raven + Lily Leather Earrings : $24 : These earrings are handcrafted from locally sourced leather by marginalized Muslim women in Northern India. Proceeds from this jewelry collection fund literacy programs for women artisans and their children in the community. Eleven : Michael Kors Watch Hunger Stop Watch : $295 : Michael Kors has joined forces with the United Nations World Food Program to fight global hunger. The WFC will deliver 100 meals to children in need for every sale of this watch. Twelve : Hand in Hand Soap & Bath Products : $22 - $36 : Hand in Hand natural soap and bath products are made with resources and harvested ethically. For every bar of soap or bath product sold, they will donate one bar of soap and one month of clean water to a child in the developing world. Such a great roundup! Love the knit cap! I will take number 2, 4, 8, 9 and 12, woah thats a lot to want but you have made it really hard to pick with all these pretty selections! You are so kind to visit, hope your week in going wonderfully. These are such great gift ideas! This its the type of gifts I love to give and receive great job. this is a GREAT list. thanks for sharing rowena! a lot of beautiful ideas!!! thanks for sharing Rowena! oh i love the Roma boots! the spiky soles are fierce! lol. but honestly i love the color and the shape. they look better than hunter ones and could easily combat the slushy roads in the city after snow!! What an awesome list, Rowena:) During the holiday season, it's always great to not only get gifts, but to get meaningful ones that give back. This is a very complete and wide selection of items, thank you for sharing! I really like how companies are trying their best to do social campaigns to help people in need. It's good to know they're been conscientious. Big fan of Toms. I actually just bought a new pair the other day. 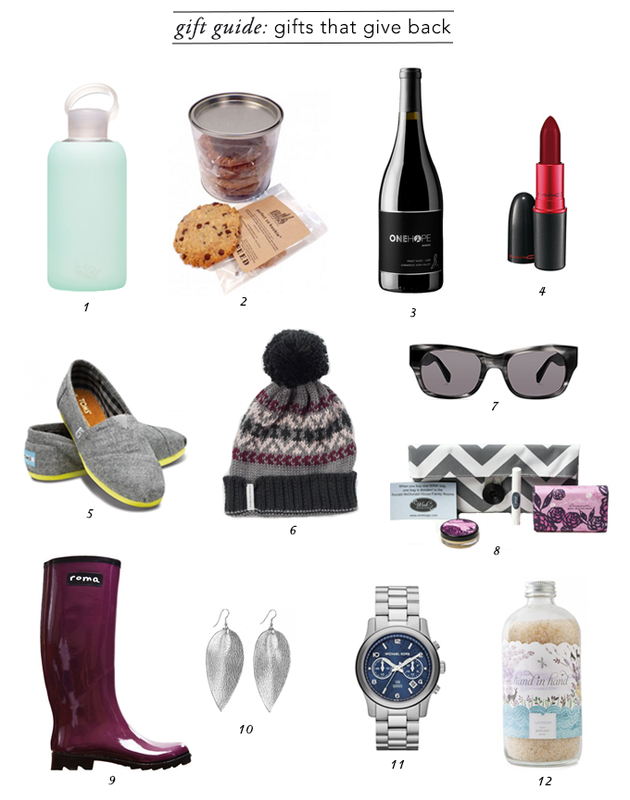 Great giving back gift guide! Great gift ideas! I love the hat! I love the idea of getting gifts that give back and I certainly wouldn't mind receiving that mac lipstick or that cute beanie! Great ideas Rowena, tnx for sharing!!! Gifts that give back are the best gifts of all. Thanks for posting this list. I will keep it mind when shopping. That wine bottle is so cute I want to get it for myself! i really love the idea of this Rowena! so many more companies are doing this now. i think it's wonderful. thanks for posting. hahaha disney needs to make doll size items of their popular items! Which software do you use to put the images together? The layout looks great!